How on earth did that happen? It seems like just yesterday, it was 1998. We were naïve young newlyweds whose eyes were blinded by love and filled with hope for an unknown future. Now, 15 years later, we still feel like newlyweds. Our dreams are still big, and we still carry that burning blaze of hope in our hearts. What that means is that, here in 2013, we’ve got an awful lot to be grateful for. Here’s our top ten list, in no particular order. LITTLE BLESSINGS: We’re thankful for friendly smiles, foraged ramps gathered and made into pesto in the spring, the flowers and wine friends bring to dinner, the joy of being together and stolen time used to can tomatillo salsa. AMAZING FRIENDS AND FAMILY: We are indebted to all the people who’ve supported us, cheered us on, and held us up as we’ve taken on any number of crazy projects (see below). We’re especially grateful for the prayers. And the love. And yes – the big hugs that came when we needed them most. You all know who you are. BUTTERY GOODNESS: Our hands are still greasy, thanks to a renewed contract for recipe development with the American Butter Institute. Currently, we’re working on perfecting recipes for weeknight chicken and dumplings and homemade granola bars. HEALING: A nasty fall down the basement stairs in June had Paul in a cast for nearly 12 weeks this summer. Grateful he healed well and no surgery was necessary. Also super grateful for our lovely neighbor who mowed the lawn ALL summer! Thank you so much, Doug! CHEESE COMAS: After getting a great deal on cheese at the American Cheese Society Conference in July (Paul’s bum ankle in tow), we threw an amazing cheese tasting party featuring over 50 different cheeses made in the U.S. Grateful for the opportunity to indulge our senses in all that fromage, and thankful for all the brave friends who joined in on the fun and helped us put a dent in 60 pounds of delicious dairy. GENEROUS PEOPLE: We’re keenly aware that every one of us has the power to make a real difference in the world. But, we were blessed this year to see what happens when people work together for good. Our food-focused social organization, MKEfoodies, raised $8100 at this year’s holiday bake sale to benefit the organization, Cookies for Kids’ Cancer. And we’re grateful to everyone who so generously traded their resources for boxes of sugary treats. COCKTAIL WEEK: We were privileged to be one of the organizations at the helm of Milwaukee’s first ever Cocktail Week this past September. It was a whirlwind of great food and artful cocktails. And it made us proud of our city and the talent harbored here – both in the food and cocktail industries. ENTREPRENEURSHIP: We were blessed with the resources (including two investors) to launch our very own company, which we named From Milwaukee with Love. The web site launched on December 1, and we now spend our free time shipping awesome little boxes of love (artisan foods made here in Milwaukee) across the country. Visit us at frommilwaukeewithlove.com. A POTENTIAL BOOK DEAL: Thanks to all of her freelancing, Lori landed her first ever book offer from a small indie publisher in South Carolina. They’d like her to pen a book about the food scene in Milwaukee. Only time will tell if she’ll take them up on it. But, it’s still pretty awesome. HEALTH AND HAPPINESS: Despite working five jobs (literally), and getting very little sleep, we’re both still sane and walking upright. We have three lovely furballs who warm our feet at night. And a little gingerbread house that keeps us warm and dry. ALL OF YOU: Thanks to all of you who kept on reading this year, despite the fact that our blogging came in fits and spurts. You've been the heart of what we do -- and the inspiration for us to continue in 2014. 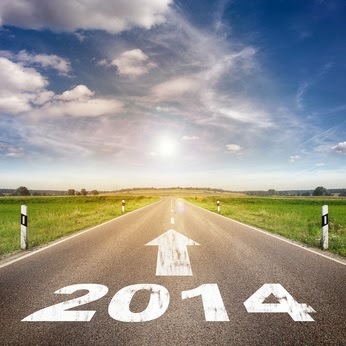 Wishing you the best of the best in 2014! Gosh, time flies! Christmas is right around the corner, but there's still time to do a bit of baking (at least we sure hope there is, since we're a bit behind this year). 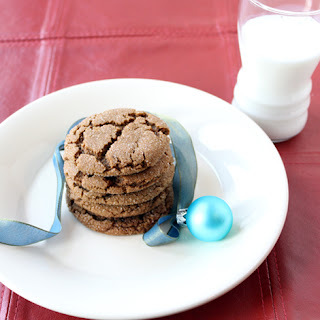 If you're looking for great recipes, here are a couple of our very favorites, along with a couple of links where you can find some of the most delicious holiday treats around. 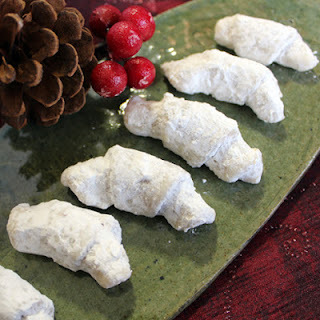 This crisp flaky cookie is filled with cinnamon, sugar and nuts -- and rolled in powdered sugar. So good -- they melt in your mouth. super easy, since you don't need to soften the butter before mixing up the recipe! And you can find even more over on the Go Bold With Butter Pinterest Page. 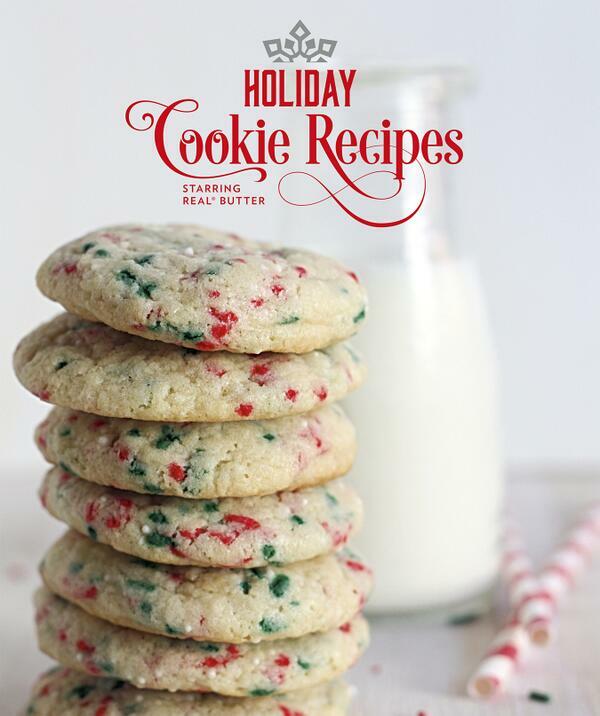 OR in the brand new Holiday Cookies Recipe e-Book. I'm not sure if we've ever done a gift guide here on Burp! But, it occurred to me that I love reading other people's ideas for what makes a great gift, so maybe the same was true for each of you. Here are a few of my favorite tried-and-true gift ideas. I own every single one of them, and I'd buy them ALL over again. Looking for a little last minute stocking stuffer for the creative cook in your life? A hostess gift? You really needn't look further than this handy set of recipe dice from Leafcutter Designs, an amazing little company that makes really cool stuff from eco-friendly materials. 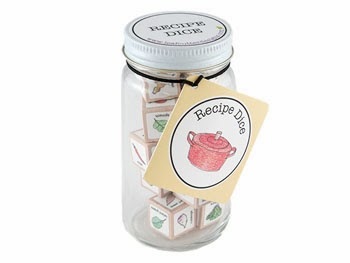 These adorable dice feature over 70 ingredients that can be used in recipes. Just roll the dice, pick up the fresh products at the grocery store or farmer's market, and get to cooking. It's just $16 and it also comes in a vegetarian version. 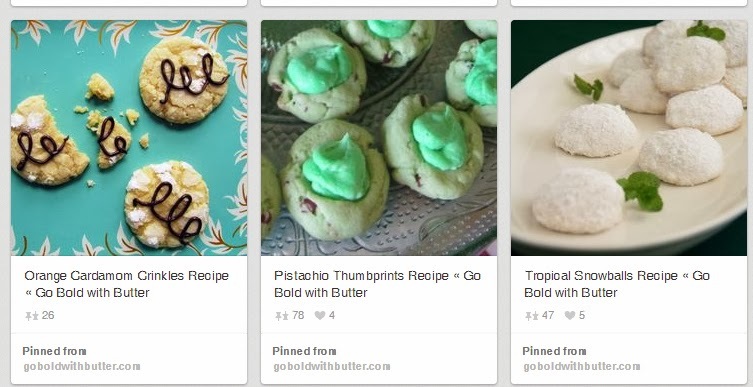 If you ask us, that's some of the cheapest cooking inspiration you can find! Check them out. 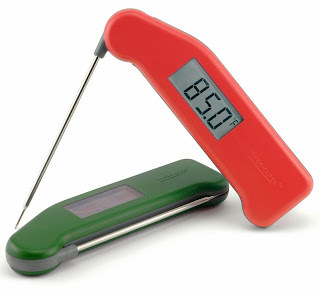 On the other hand, a not-so-cheap, but oh-so-worth-it find is the Thermapen. It's the perfect gift -- because who wants to spend almost $100 on a thermometer for themselves? If you have ever sat -- impatiently -- with your meat thermometer poking out of a roast while waiting for it to register the temperature, only to find that it never seems to give you an appropriate reading, this is for you. If you frequently burn yourself trying to take a temperature reading on foods that are cooking on your grill, this is the perfect solution. The fact is, Thermapen is hot stuff. Originally designed for commercial kitchens and labs, this little work-horse gives you an accurate temperature reading in 3 seconds flat. It doubles as a candy thermometer (so you don't need two types hanging around). It's also water resistent, it comes in pretty colors, and it's super easy to use. Oh -- and the battery life is 1500+ hours. So, unless you're poking meat for a living, it should last you a good long time! I got one of these fancy little buggers for Peef last year on his birthday, and I can't tell you the sort of happy dances he's been doing ever since. So, this is also the perfect "man gift." Well worth the $96. 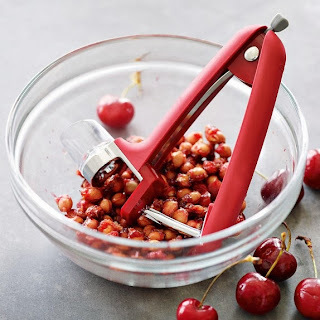 You wouldn't think a cherry and olive pitter would make such a huge difference in a cook's life. But, a good one really does. The OXO Good Grips pitter works like an absolute charm. It plows through pounds of Door County cherries in no time, and it does its best to keep hand-fatigue at a minimum. It also features a splatter guard to keep juice from spraying everywhere. As for olives, you can thank your lucky stars that you'll never have to buy those mushy pre-pitted Mediteranean olives again. For just $13, you really can't go wrong. We're linking out to web sites where you can get more information (or order) these items. But, please remember -- whenever possible -- buy your gifts from local, independently owned shops! It really makes a difference for those businesses. AND it keeps money in your local economy.